You can download the game from Google Play. If you have never played Ghost SEED before, you will need to create a new game account. In Ghost SEED, you choose a side in a three-way struggle for control for the newly discovered Quantum Realm - a place where the basic structures of the universe are observable and malleable. 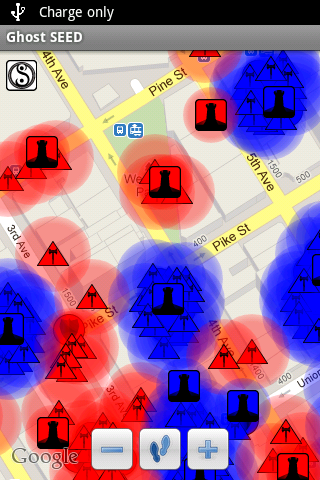 Ghost SEED is location-based, which means that your actions will be centered around your observed location in the world. 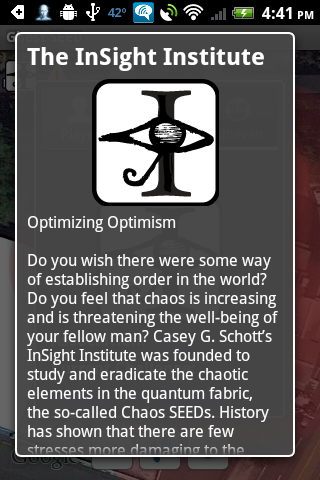 Your objective in Ghost SEED is to expand your organization's influence and hinder the competition's. 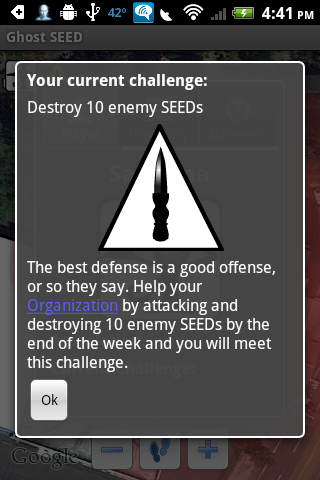 You do this by placing quantum SEEDs which claim territory, attack enemies, and defend allied SEEDs from enemy attacks. Ghost SEED is played on a Google map, which displays your observed location as well as all the SEEDs around you. You cannot see other players on the map - you only see their SEEDs. When you are zoomed in, you will see halos around the player icon and the SEEDs on the map. These halos represent area of effect and reach. Your reach shows how far away you can place SEEDs. The halo around a SEED shows its area of effect. SEEDs and their halos are colored to show who owns them: Your SEEDs are green, hostile SEEDs are red and friendly SEEDs (that belong to other members of your organization) are blue. Purple SEEDs are naturally occurring Chaotic SEEDs. When you zoom out the map changes to a regional view, showing the organizations that have influence over various areas. One of the interesting things about quantum mechanics is the idea that observing something has an effect on it. In quantum mechanics, a tree that falls in the forest without anyone to hear may not even have fallen. 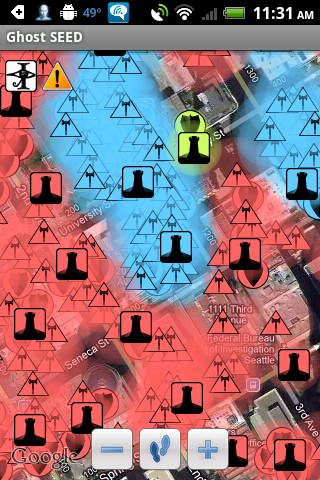 Your position on the Ghost SEED map is based on your ability to be observed. 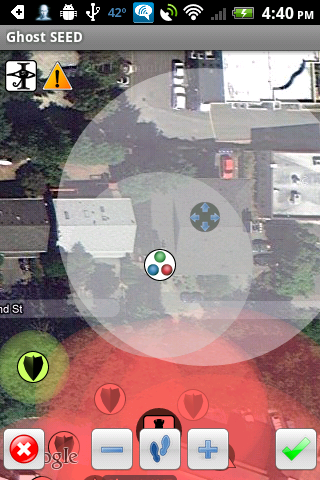 Your mobile device observes GPS satellites. It is observed by cell towers. When you are not sufficiently observed in the game, your in-game location will drift away from your real world location. This is called "Ghost Mode". If the background of your player icon changes from white to grey, you are in Ghost Mode. If you cannot be observed at all, the icon turns completely grey. When this happens, you will not be able to play Ghost SEED until you can be observed again. Ghost Mode is unpredictable - you may find yourself drifting several blocks away from where you really are. Watch for it, and be sure to use this to your advantage. You may find yourself drifting far enough to establish a new FORT and tip the balance of power. FORT SEEDs claim all the territory within their reach and prevent enemy SEEDs from being placed within their reach. The number of FORT SEEDs an operative establishes for their organization decides the extent of its influence, therefore placing and defending them is crucial to success. From time to time, you may see Chaotic SEEDs, which are a type of naturally occurring FORTs. Each of the organizations has a different theory about what these SEEDs do, but all agree that they should be destroyed when you find them. AXE SEEDs attack any enemies within their reach, starting with the nearest one. They come in two varieties: Long and Short. Short AXEs have a shorter reach than Long AXEs, but they have a stronger attack. WARDs are defensive SEEDs. Any attack from a hostile SEED which passes through the range of a WARD will be intercepted by the WARD. The attacker will have to destroy the WARD before they can proceed to their original target. Like AXEs, there are two varieties of WARDs: Near and Far. Near WARDs have a shorter reach than Far WARDS, but they have a stronger defense. 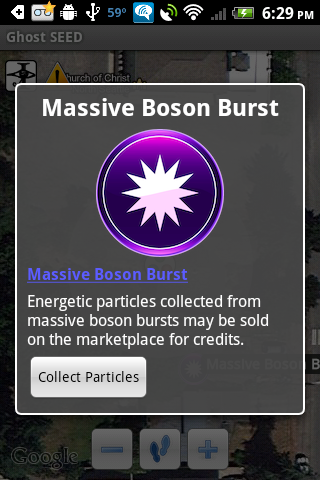 You will occasionally see massive boson bursts on the map. When you move so that one is within your reach, you can collect energetic particles from it. You can sell these particles on the marketplace for credits with which to buy additional SEEDs. Influence matters when you collect: Collecting within areas of friendly influence gives you more particles. The key to Ghost SEED is placing SEEDs. When you select a SEED to place, you will see a ghostly outline of the SEED and its reach, allowing you to experiment with different placements for the SEED before finalizing its placement by tapping the checked button. If the button disappears, it means that you can't place the SEED in the spot you've selected - try moving it around. Energetic Particles may be collected from massive boson bursts and sold on the marketplace. These bursts are not uncommon, but you will often have to move around to get close enough to collect particles from one. You will sometimes also collect small numbers of particles when you attack enemy SEEDs. Challenges sometimes award credits for meeting them, and large-scale campaigns typically award credits to all active members of the winning organization. You may also purchase credits in-game through in-app purchases. For players who love battle but hate collecting particles, buying credits can be an enormous time saver. As you play the game, you will be given challenges. In the beginning, these challenges help teach you the basics of Ghost SEED. Later, they will encourage you to expand your territory and develop effective tactics. Meeting these challenges will sometimes earn you awards and credits. Campaigns are large-scale struggles between the three organizations. Campaigns may revolve around clearing Chaotic SEEDs, claiming territory, or destroying enemies. Active members of the winning organization will earn campaign badges and credits as awards. Ghost SEED is a massively multiplayer game. While it is possible to play alone it is more rewarding to play with friends, working together in large scale strategic planning. Ghost SEED features a chat system allowing you to talk with other players to coordinate your actions or celebrate your victories.